We all know that Project is an endeavor that has a definite start and end. Thus, it makes it all the more important to have well defined life cycle in place. Life cycle is helpful in laying out transparent and time bound entry and exit points throughout the project stages. Time boxing the stages ensures we stay on track and deliver with quality. One of the key objectives of any project is always having a balance among the triple constraints – Time, Cost & Quality. The better the balance, better the chances of the project being successful. 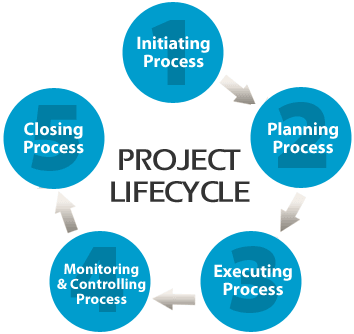 No matter what project it is that you’re preparing for, the project management life cycle can assist you and your team in narrowing the project's focus, keeping its objectives in order and finishing the project on time, on budget and with minimum surprises (unwanted)! PMI is the world’s largest nonprofit membership association for the project management profession. It has set the standards for project, program, and portfolio management and offers training and certifications. The gold standard of certification from the association is the Project Management Professional (PMP) certification. Initiation is first phase of project management life cycle where the feasibility and the business value of the project are determined. The key outcome of the Initiating phase is our "Project Charter"! It is the bible of your Project! The answer to all your project disputes, concerns, and doubts are covered in the Project Charter. So why do you think this is such an important document? As common logic says – before we undertake any endeavor we perform certain background checks, initial research, execution feasibility, and commercial viability and then decide if it should be undertaken at all. - Defining project resources, cost &budget. It is quite evident why a Project Charter is the most important document of any project. - Why a project was undertaken? What problems need to be addressed? - What specific strategic gaps and initiatives need to be served? - What needs, objectives and profits were served by this project? - Who are the key stakeholders, sponsors and project team? - What are the roles and responsibilities of each person associated with the project? - What does the project entail? What will be exactly delivered and left out of the deliverables? - What is to be delivered, at what time and within how much cost? - And lastly who is in charge and authorized to run the project? PMP Tip- PMI gives a lot of significance to the Project Charter& has a dedicated process named "Develop Project Charter" in the Initiating Process group / Integration Management Knowledge Area. We all have heard it, know it, yet often fail to implement it. Planning is the second yet most important phase in the project management life cycle. Project planning is at the heart of the project life cycle, and tells everyone involved where you’re going and how you’re going to get there. The planning phase is when the project plans are documented, the project deliverables and requirements are defined, and the project schedule is created. It involves creating a set of plans to help guide your team through the implementation and closure phases of the project. The plans created during this phase will help you manage time, cost, quality, changes, risk, and related issues. They will also help you control staff and external suppliers to ensure that you deliver the project on time, within budget, and within schedule. Creating a Project Plan:- The Project Plan is you project blueprint and a project manager’s best friend. It helps the Project Manager to be in-sync with the roadmap and maintain progress accordingly by taking informed decisions at the right time. Creating a Resource Plan:- A Resource Plan provides information about the level of resources that is needed to complete a project. A properly documented Resource Plan will specify the exact quantities of labor, equipment and materials needed to complete your project. At here, we also consider the skill of the resources that is whether the resources have the relevant expertise required for the project. Creating a Financial Plan:- A Financial Plan helps set budget for your project. To deliver your project within budget, you need to produce the project deliverables at a total cost which does not exceed allotted budget. Creating a Quality Plan:- Quality Planning is an essential part of any project. It helps you to monitor and control the level of quality produced by the project, to ensure that you meet the required quality targets. Creating a Risk Plan:- A Risk Plan helps you to identify the potential risks and how to mitigate them. The Risk Management Plan is created as part of the Risk Planning process. The risk plan contains lists of all potential risks, their ranking or level and priority, the preventive actions, along with a process for tracking them. Creating an Acceptance Plan:- Acceptance plan is the list of the task that is designed to meet the customer requirement. The Acceptance Plan includes a list of the deliverables, the acceptance test activities, the criteria and standards to be met, and the plan for their completion. Creating a Communication Plan:-:- A communication plan describes the approach to provide information to the stakeholders. A communication plan contains the list of information that should be shared with the stakeholders, project members and the PMO, at what schedule and frequency, the right means of communication (email, standup meeting, daily meeting, weekly meeting, ppt. etc.) and how/where the relevant documents and reports can be accessed and by whom. Creating a Procurement Plan:- Procurement planning is the process to decide what to buy, what are procedure should be followed to buy and sources from which required materials to be purchased. This is the phase that is most commonly associated with project management. Execution is all about building deliverables that satisfy the customer. Team leaders make this happen by allocating resources and keeping team members focused on their assigned tasks. Execution relies heavily on the planning phase. The work and efforts of the team during the execution phase are derived from the project plan. Assemble Execution Phase Project Team:- Acquiring required resources who can work on the project. Team Development:- Dividing the resources into small teams to work on certain modules. 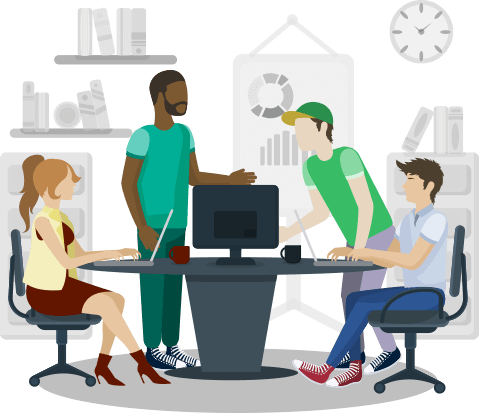 For example, if you are working on website development, one team can be assigned for UI/UX design of the website, other team for the backend design, similar a team to perform testing and so on. Assign Resources:- Assigned skill or expert resources to the project. Obtaining the right resources for the project is crucial for project success. A high skill to requirement mapping will enable smoother and timely task execution. Execute Project Management Plans:- Set your schedule into action. Direct and Manage Project Execution:- This involves leading and performing the work defined in the project plan and implementing approved changes to achieve the project's objectives. Conduct Progress Status Meetings:- Having periodic status checks helps keep the team motivated, stay on track, address any real or perceived threats in advance and take corrective measures as required. Update Project Schedule and Management Plans:- As the project progresses, we must update the project schedule and plans in order to ensure the project is set to be delivered within the agreed timelines. However, this phase is optional if the project is already on track. Quality Assurance:- Review tasks and deliverables are up to the mark or not. And what corrective actions are required to meet the defined quality guidelines. Acceptance of Deliverables:- Verify if the developed project meets the deliverables, fulfills all the standards and criteria set by the customer. So much time and effort is put into the planning of a project, it is often forgotten that the end of a project is equally important. There’s a lot of work involved even once a project is technically complete. You handover all deliverables to your customers, relevant stakeholders, release the project into business as usual and handover to the operations team, free all your resources, return equipment and notify all of project closure. Lessons Learnt:- Managing a project isn’t only about tasks and resources, budget and deadlines, it’s an experience you can constantly learn from. While you should have been learning throughout the project, now is a great time to look back without the pressure and distractions that might have dulled your focus. Gather the core team to invite feedback about what worked, and what didn’t. Encourage honesty. Clearly document the lessons learnt, celebrate how a major mishap was averted, what remedial actions brought a positive turn around to the project, what aspects were missed, where they were missed and capture their impact on the project. You can go back and look over the information for precedents when planning for new projects. There’s a wealth of knowledge produced at every project closure and smart organizations share this wealth with a lot of zeal. Complete paperwork:- Acquiring required resources who can work on the project. This includes a complete documentation of the project, approval from the stakeholders, Legal contracts of the projects should be verified and signed up by the stakeholders. It also includes addressing outstanding payments and sending invoices for the payments. All dues must be settled and vendor contracts must be closed before proceeding to project closure. Release resources:- This is a formal procedure, in which resources are assigned back to the project pool and made available for new projects. If there were contractors involved then they are released and the contracts cancelled post all due settlement. Archive documents:- It is important to archive all project documents to be used for posterity. We learn from the mistakes from every project. Having all project documents neatly stacked on a relevant shared portal or with the PMO is in the best interest of the organization and will also come in handy for any issues that may arise in the future. Hope you have now had a proper glimpse of the various project management phases and an overview of what are their key outputs and how they help running projects successfully. In the next chapters we will look into each of the phases in further detail.